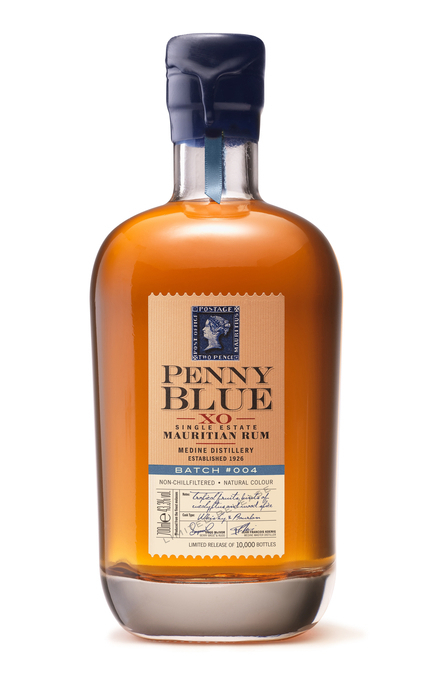 Penny Blue rum is packaged in a stumpy 'little sumo bottle' on the Medine estate without chill-filtration or any additives, including caramel. It is named after the Penny Blue stamp which was printed in Mauritius in 1847, immediately becoming a collectors’ item due to its inscription. A mistake by the carver on the wooden printing block resulted in the stamp reading ‘Post Office’ rather than the usual ‘Post Paid’. Of the thousand stamps originally printed only twelve are thought to be in existence today and trade for over $1m a piece. A batch blend of 5,946 individually-numbered bottles released in October 2013. 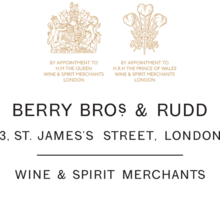 This first Penny Blue blend was created by Doug McIvor of London’s Berry Bros. & Rudd and Jean Francois Koenig, Master Distiller at Medine Distillery, from 14 casks comprising a combination of American oak whisky and French oak cognac casks. Appearance: (batch 001, bottle No. 1205) Mid golden amber with golden highlights. Aroma: Tobacco leaf, walnuts, tropical fruits and espresso with treacle, molasses, eucalyptus, old oak wardrobe, dried apricot, orange zest, clove and cinnamon. Taste: Dry and yet fruity – well-balanced with graceful old oak, eucalyptus, dried apricot, tropical fruit, orange zest, walnut, cinnamon spice and nutmeg. 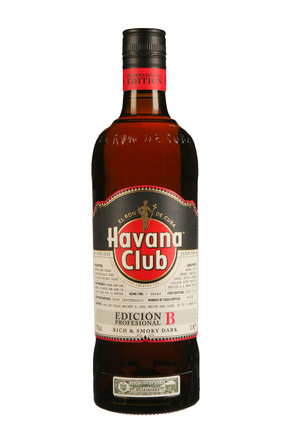 Aftertaste: Long, tobacco leaf and oak with eucalyptus and lingering nutmeg spicy oak. 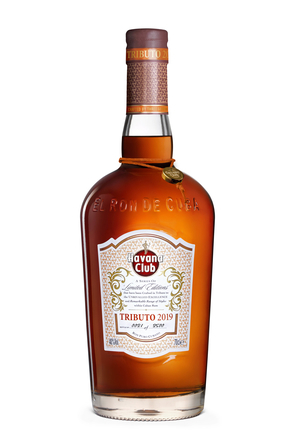 A batch blend of 7,000 individually-numbered bottles released in July 2014. 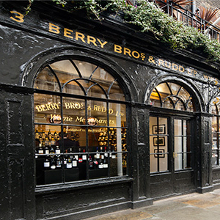 This second blend of Penny Blue was also blended by Doug and Jean, this time from 22 casks consisting of three types: cognac, whisky and bourbon. Ten percent of the first batch was added to ensure some consistency. 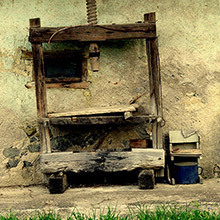 The youngest rum in this batch is 5 years old and the oldest 11 years old. Aroma: Tropical fruits, tobacco leaf, toasted almond and mocha espresso with molasses, eucalyptus, old oak wardrobe, dried apricot, orange marmalade, clove and cinnamon. Taste: Dry and yet fruity - well-balanced. Orange zest, orange marmalade, graceful old oak, eucalyptus, dried apricot, toasted almond, cinnamon spice and nutmeg. Aftertaste: Long, tobacco leaf, orange zest and oak with eucalyptus and lingering nutmeg spicy oak. A limited release of 5000 bottles available exclusively at Mauritius duty free. Blended from 18 casks 17% ex-whisky,28% ex-bourbon and 55% ex-cognac. The vintages are from 2003 and 2009, thus the oldest is 10 years old and the youngest 4 years old. Appearance: Clear, clear golden amber. Aroma: New leather upholstery, tarte tatin, donuts frying in old oil, tobacco and nutmeg with dried raspberries, treacle, orange zest and coffee crème caramel. Taste: Medium bodied. Bitter, orange oil, old fashioned oil paint, tarragon, passion fruit and spicy oak. Aftertaste: Honey, orange oil, dry oak and spice with lingering black pepper, tannins and clove spice. Overall: A faint hint of pistachio and plastic boxes pervades (in a good way) with bitter orange oils, passion fruit and spice. A batch blend of 10,000 individually-numbered bottles released in August 2013. A blend of 66% ex-whisky casks and 34% ex-bourbon casks (34%). 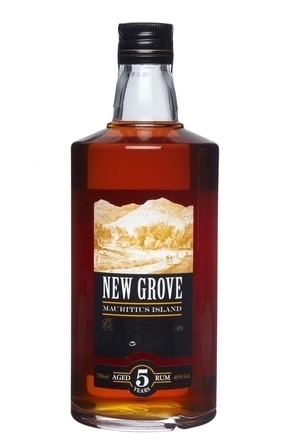 The oldest rum in this blend is 2003 vintage, thus this rum is 11 years old. Appearance: Very faint haze, golden amber. Aroma: Mandarin and lemon zest with passion fruit, dried apricot, vanilla, eucalyptus, sandalwood and brazil nuts. Taste: Medium bodied. Zesty mandarin and lemon with bitter citrus oils, sweet vanilla, brazil nuts and sandalwood. Aftertaste: Lingering bitter citrus oils, dry oak and mild cinnamon and clove spice. Overall: Beautifully balanced, dry complex and honest. Zesty citrus and tropical fruit with nutty and spicy wood. Very faint haze, golden amber. Mandarin and lemon zest with passion fruit, dried apricot, vanilla, eucalyptus, sandalwood and brazil nuts. Medium bodied. Zesty mandarin and lemon with bitter citrus oils, sweet vanilla, brazil nuts and sandalwood. Lingering bitter citrus oils, dry oak and mild cinnamon and clove spice. Beautifully balanced, dry complex and honest. Zesty citrus and tropical fruit with nutty and spicy wood. 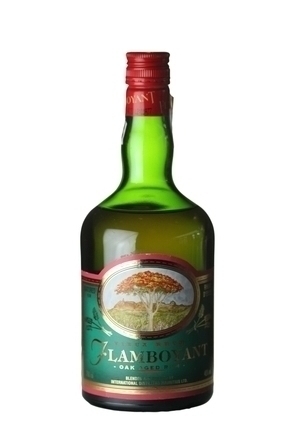 Aged for five years in French Limousin oak casks and port pipes on the island of Mauritius.